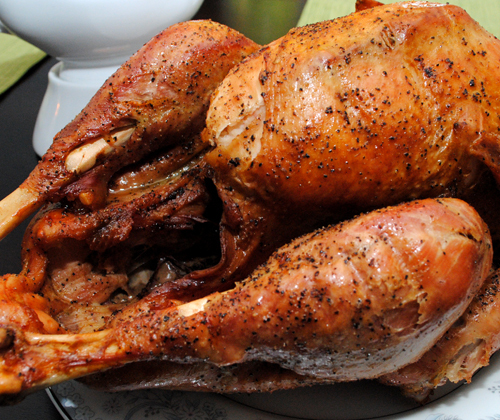 This recipe from the Glen-Mor Restaurant does not brine the turkey, like popular recipes today, but the result of this recipe is a juicy turkey worthy of a holiday occasion. *Note – if planning to make Turkey Stock from the turkey carcass, double the celery, carrots, and onions, and set aside half for use later in the stock. Pre-heat the oven to 350 degrees-F. Make mirepoix by roughly chopping the onion, unpeeled carrot, and celery, set aside. If planning to make Turkey Stock, double the vegetables chopped and set half aside for use later. Remove the giblets and neck and set aside. Rinse the turkey and pat dry. Drizzle the oil over the turkey and rub into the skin. Generously salt and pepper the turkey. Place the turkey in a large roasting pan, breast side up, with the giblets and neck in the pan under the roasting rack. Place the pan in the preheated oven and cook for two hours. Remove the pan from the oven and add the mirepoix, cook for an additional 1-1/2 hours, checking temperature periodically. If the breast is getting too brown, cover with aluminum foil. Breast should measure 170 degrees-F when done. Let the turkey rest for 15 minutes before carving. Reserve the cooked mirepoix, neck, giblets, and pan drippings to make Turkey Gravy. Reserve the turkey carcass to make Turkey Stock.